The CAA Annual Conference returns to New York in 2019. From February 13-16, at the New York Hilton Midtown, we welcome all those in the visual arts to attend over 300 sessions and professional development workshops, and dozens of receptions, parties, and special tours at local museums and cultural institutions. The Book and Trade Fair and the Cultural and Academic Network Hall, with hundreds of booths showcasing the latest products, programs, and books, will occupy three floors of the Hilton New York Midtown. Our partners offering free admission and special tours this year include The Frick Collection, The Morgan Library & Museum, The Jewish Museum, Dia Art Foundation, the Rubin Museum of Art, the New York Public Library, the Neue Galerie, and many others. The 107th CAA Annual Conference content will address the full breadth of the field of visual arts and design and examine a range of cultures, histories, and scholarship. We anticipate more than 5,000 professionals in the arts to attend the conference in New York. Sessions will include “Below the Mason-Dixon Line: Artists and Historians Considering the South,” “Deskilling in the Age of Donald Trump,” “Immigration and Inclusion in Art Museums,” “Supporting Immigrant Artists and Communities,” “Mapping Crime,” “Endangered Data,” and “Racist Human Mascots: A Guide for Artists and Designers to Determine the Qualifications of Racism in Commercialized Art,” among hundreds of other panels. The Distinguished Scholar for the 107th CAA Annual Conference is Dr. Elizabeth Boone, the Martha and Donald Robertson Chair in Latin American Studies at Tulane University. Dr. Boone specializes in Pre-Columbian and early colonial art of Latin America. 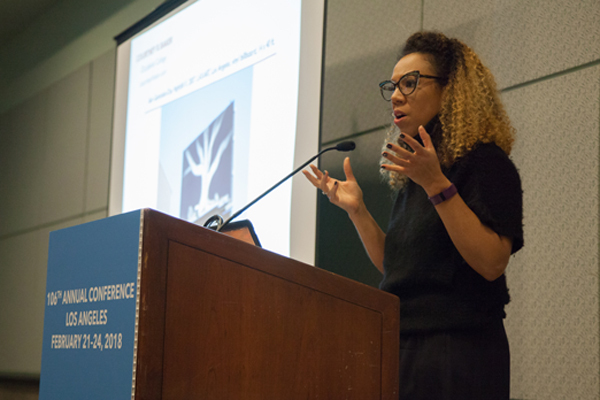 New this year, the CAA Annual Conference will feature twenty professional development workshops supported by The Emily Hall Tremaine Foundation. The workshops add to CAA’s annual workshop offerings for a total of thirty available workshops at the Annual Conference. The Emily Hall Tremaine Foundation workshops will be led solely by MFA candidates and adjunct faculty with the aim of strengthening practical, hands-on skills for studio artists as well as providing professional development opportunities. Once again, CAA will offer a number of travel grants and scholarships to individuals looking to attend the Annual Conference. With the generous support of Blick Art Materials and Routledge, Taylor & Francis, CAA will provide eight student member registrants with $250 each to attend the conference.